We will do everything possible to prevent drain excavation. Sometimes, in worst-case situations, replacement of the drain pipe is necessary and a no-dig replacement just won’t do it, in these cases we carry out fast, minimal damage drain excavations. Occasionally a blockage is just too tight, a tree root too grown in or a drain pipe too seriously damaged or even collapsed; in these cases fitting a replacement pipe is the only option and excavation is required. We don’t take excavations lightly as they can be very disruptive as well as taking longer and costing more than our no-dig methods, but when we really are faced with no other choice we minimise the digging as much as possible and carry out all works in the quickest possible time. Have your drains professionally excavated by time served experts. 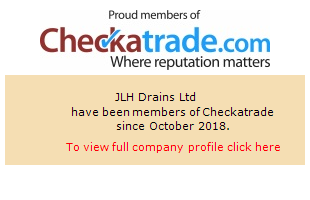 Call JLH Drains today on 0800 781 8922 and we'll dispatch one of our experienced team to your premises as soon as possible. We have such a range of tools and experience available to us that excavations are quite rare in modern drain repairs, unfortunately they are still an occasional necessity and we are always trialling alternative methods and products to give our customers the best possible service. Fully qualified, accredited, insured and working to all health and safety standards, JLH Drains always aim to offer the most straightforward and low cost option available to all our customers. Our team work across the county and South Eastern quarter of London providing fast and effective drain excavations on domestic and commercial projects. With offices in Maidstone, Medway, West Malling, Gravesend and Sheerness we’re never more than 90 minutes away from Sidcup, Dartford, Newington, Sittingbourne, Orpington, Swanscombe, Parkwood, Northfleet, Crayford, Sheppey, Whitstable, Margate, Herne Bay, Ramsgate, Crayford, Bromley and London. Whatever your drain excavation, CCTV drain surveys or general repair needs speak to the experts at JLH Drains for a professional, high quality service; contact us today and arrange a no obligation survey and quotation with one of our friendly team.